In the fall of 2003, I noticed that there did not seem to be a skating website that was organized the way that I would have done it, and I hated jumping from website to website to find the information that I needed. After running the idea by a few friends, I decided to begin the groundwork on Tracings.net, not realizing then what an extensive project it would become. A year was spent designing the website, experimenting with organization, researching profiles, and beginning to archive the initial season. When Tracings was officially launched in September 2004, it had a full year of results in the archive and I planned to keep up with the season while adding profiles and more result archives. 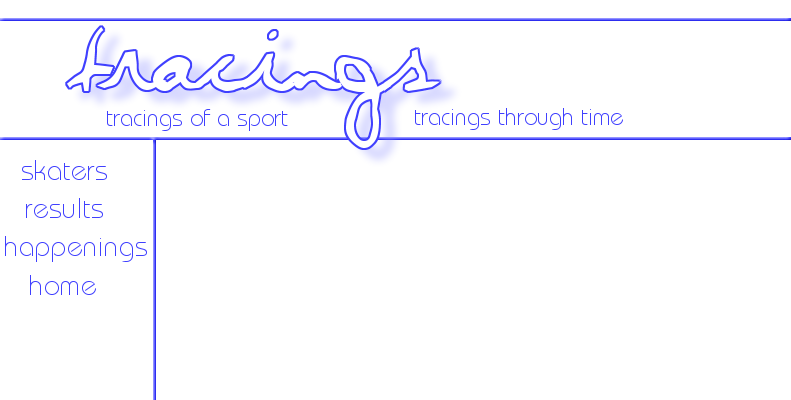 The task has been slow going, but Tracings has become one of the most comprehensive websites for figure skating results and biography information on the internet. It has also expanded to include photography from the events that I attend. I earned my Bachelor of Arts in English from Olivet College in Olivet, Michigan, in 2008. I am currently completing my nonfiction thesis, the last piece of my MFA in Creative Writing at Roosevelt University. Since 2007, I have worked as a photographer, journalist, and editor at Ice-Dance.com, where I lead the Canadian beat. In late 2010, I also began writing a couple of regular columns for International Figure Skating. My interest in figure skating began in 1992, when the pairs caught my eye during coverage of the Olympic Games. Although I was young, but I recognized the beauty in the sport, and I loved the way that it was set to music. As a writer, skating challenges me to transfer the beauty of movement to the written word; as a photographer, I'm given the task of freezing that movement so it can be shared with others; and as someone who is entirely too emotional, skating has given me countless opportunities to get swept away in its magic. Although I was raised in Chicago, I was always drawn to Canadian skating, and now my favourite event to attend each year is the Canadian Championships. My favourite discipline is ice dance.